Towhees are a kind of large sparrow. Look for their thick, triangular, seed-cracking bill as a tip-off they're in the sparrow family. Also notice the chunky body and long, rounded tail. Males are striking: bold sooty black above and on the breast, with warm rufous sides and white on the belly. Females have the same pattern, but are rich brown where the males are black. Eastern Towhees spend most of their time on the ground, scratching at leaves using both feet at the same time, in a kind of backwards hop. They spend lots of time concealed beneath thick underbrush. You may see this bird more often when it climbs into shrubs and low trees to sing. 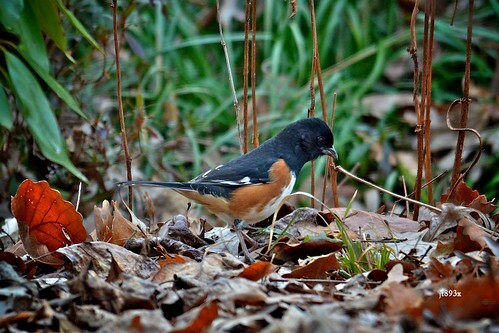 Look for Eastern Towhees in brush, tangles, thickets, and along forest edges where there's plenty of leaf litter for the birds to forage in. This Eastern Towhee came out after a thunderstorm swept through and knocked out the power. To me, it looks like it has an executioner's hood on. 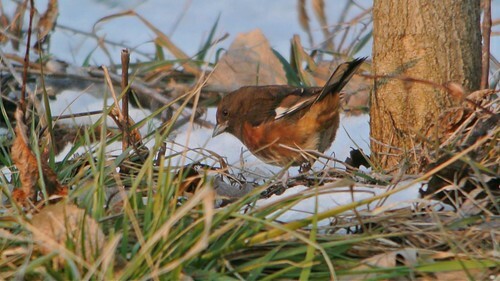 Eastern Towhee (Pipilo erythrophthalmus). --- Open Window Videos are videos of a scene that appear and sound as if you are looking out an open window into a landscape. These nature sound videos are meant to played in the background on a screen as if you had an open window. They are best viewed on a flat screen TV on the wall or computer monitor. 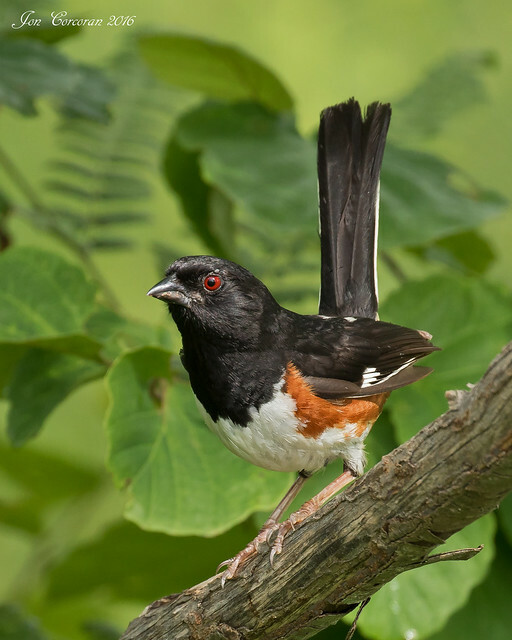 The Music of Nature proudly presents "Eastern Towhee," a video portrait that features exquisite footage and great sound. The video includes scenes depicting several individuals; note the considerable variation in song. The "classic" song sounds like "drink your teeeee." The call sounds like "tchweee" or "tow-weee". first time I have seen one.